Another successful Christmas social at GRCI! Updated Friday December 7, 2018 by Stanley Park Optimist Club. One of the Optimist Club of Stanley Park's annual projects has been providing financial support to the students of Grand River Collegiate for the hosting of their annual Student and Senior Christmas Tea. This year (2018) was the 27th annual event, and (again) as big as ever requiring significant funding support to ensure success while accomodating all the attendees! 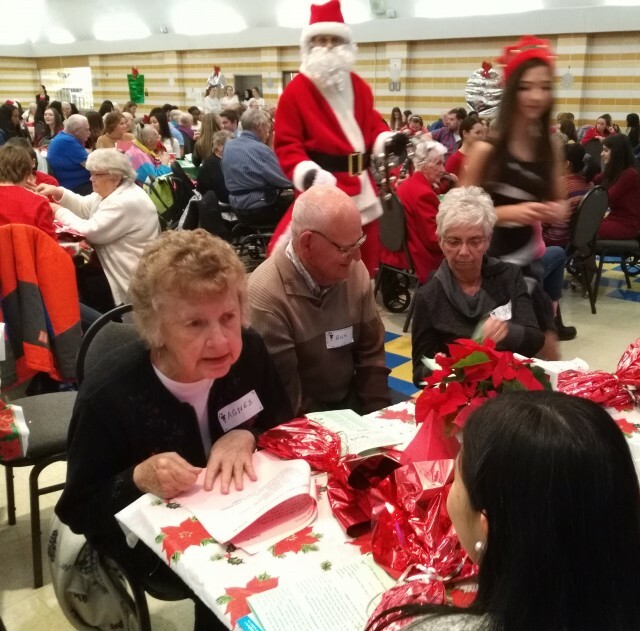 It's now a well-established afternoon tradition (first Wednesday in December) that provides an opportunity for students to make connections with seniors in the community -- and Optimist members!. Seniors attended from local establishments including Victoria Place, Conestoga Lodge, Doon Village Retirement Home, Trinity Village, Winston Park, Highland Place, Countryside Retirement Home, Pine Haven, and Sunnyside Retirement Residence in addition to family members and guests of GRCI's students. The event featured an afternoon of entertainment showcasing the musical talents of both students and staff and refreshments prepared by GRCI’s hospitality classes. In total, well over 400 students participated in a various capacities: musicians, performers, food prepares, servers, decorators, organizers, tech crew, stage crew and Santa helpers. Over 30 staff members also volunteered their time to coordinate, organize, and facilitate this great community outreach event. Well done GRCI for giving back to your community and starting the festive season off in the spirit it was meant to be celebrated - we're glad to be able to help!